FRANK A.1 STRELESKY was born in Nov 1850 in Moravia, Austria. He died after 1920 in Nebraska, USA. (According to Alice Strelesky, Frank Strelesky was sent to an old folks home in Nebraska. She suspects he died and was buried there without any of his family.) He married FANNIE I. HAINEY. She was born in Mar 1848 in Moravia, Austria. She died about 1910, probably in Sioux City, Iowa, USA. i. AGNES L2 STRELESKY was born on 11 Jan 1872 in Mineral Point, Iowa, Wisconsin, USA. She died on 30 Apr 1960 in San Francisco, San Francisco, California, USA. She never married and had no children. 3. iii. MARIE STRELESKY was born on 27 Mar 1877 in Mineral Point, Iowa, Wisconsin, USA. She died on 21 Aug 1942 in Dubuque, Dubuque, Iowa, USA. She married THEODORE M. SMITH on 23 Nov 1911 in Sioux City, Iowa, USA, son of Mathias Smith and Elizabeth Neifient. He was born on 14 Oct 1883 in Medford, Taylor, Wisconsin, USA. He died on 29 Oct 1949 in Dubuque, Dubuque, Iowa, USA. 5. v. AMELIA “Mildred” STRELESKY was born on 05 Jul 1883 in Mineral Point, Iowa, Wisconsin, USA. She died in Jan 1974 in Scottsbluff, Scotts Bluff, Nebraska, USA. She married JAMES ARTHUR MOORE on 21 May 1907 in Superior, Douglas, Wisconsin, USA, son of Fred M. Moore and Amanda Alice Atkinson. He was born about 1883 in Cedar Rapids, Linn, Iowa, USA. They divorced before 1930 and she raised the children alone. vi. LEVINA BARBARA STRELESKY was born on 02 Nov 1887 in Mineral Point, Iowa, Wisconsin, USA. (CA Death Index lists her as being born in 1907 – sheʹs was NOT. She was born in 1887.) She died on 30 Jun 1947 in San Francisco, San Francisco, California, USA. She married LOUIS A. LARSEN in 1925. He was born about 1900 in Iowa, USA. They divorced. She had no children. 6. vii. ALBERT FRANK STRELESKY was born on 11 Jun 1888 in Mineral Point, Iowa, Wisconsin, USA. He died in May 1965 in Nebraska, USA. He married (1) DORA GLADWIN before 1915. She was born about 1892 in Nebraska. They divorced after a tumultuous marriage in 1925. He married (2) HARRIET JANE HOTCHKISS on 08 Nov 1926 in Council Bluffs, Pottawattamie, Iowa, USA, daughter of Lewis S. Hotchkiss and Henrietta Melcher. She was born in May 1885 in Nebraska, USA. She died in Mar 1962 in Omaha, Douglas, Nebraska, USA. viii. 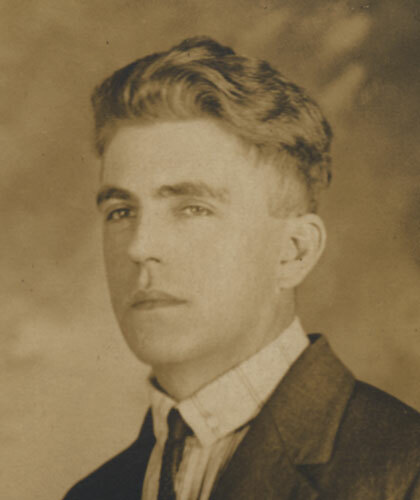 JAMES ALEXANDER “Al” STRELESKY was born on 06 Jul 1892 in Mineral Point, Iowa, Wisconsin, USA. He died on 03 Apr 1980 in San Jose, Santa Clara, California, USA. He never married and had no children.